We have our first teen driver in our home. We have spent countless hours on the road, in the passenger’s seat, preparing her for this new and important task. Teaching teen drivers can be a scary task! It is more than just the mechanics of driving, there are so many things to think about and look ahead for! I have to admit that I did not take the bulk of the responsibility for teaching our daughter to drive. My husband, Joe, was a driving instructor when we met. He taught on the road and in the classroom for many years. For this reason not only did he teach our daughter to drive, but has helped countless other teens in our lives to obtain their license. 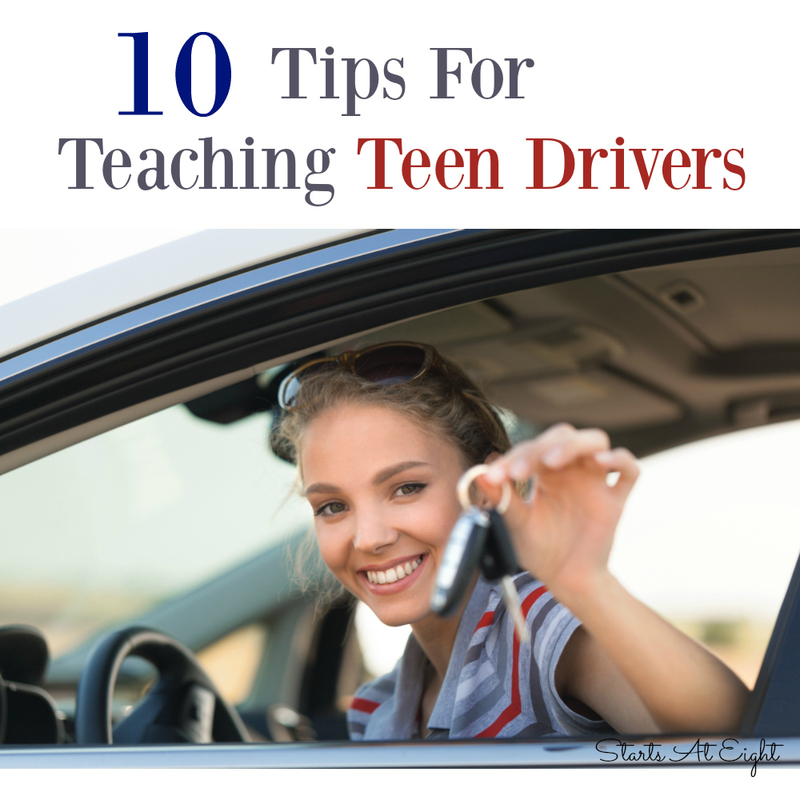 These tips for teaching teen drivers come from his years of experience teaching both teens and adults alike to drive. Spend more time on speed control than you think you need. This is the main building block to all other maneuvers while operating a motor vehicle. It will make both you and your teen feel safe and more confident. Contrary to how “speed control” sounds, this means spending time on brake control, not gas. They should be able to stop the car without being able to feel it. If you can’t properly control the brake, your teen driver has no business using the gas. This tip is related to using your eyes to help control the car. The inexperienced driver will often make this rookie mistake by staring at the hood while going straight, or fixating on objects on the side of the road while making turns. Make sure your teen is looking through the center of their target lane on their turns. When driving straight, have them set their vision farther up the road where they want the car to go. This tip applies to many sports as well and has more to do with the coordination of your body with your mind. Look where you want to go! Coaching your child through a high stress, busy intersection can be stressful and will require practice. Consider taking another licensed adult out driving and have them pretend to be a new driver. Coaching them through intersections and other difficult situations is a good way to get the experience you need to train. You will be surprised at how many steps an experienced driver does without thinking. Doing this a few times before you take your teen out will help your teen immensely and allow you to feel more confident controlling the situation with your words. Create code words for you and your teen while you drive. You can say “my car”, that will cause your teen to stop what they are doing and let go of the controls. This will allow you to take control from the passenger seat or them to take step by step instructions from you without question. You should practice this a few times in a parking lot so when a high stress situation arises, they completely trust you. 4. What are they looking at? You can have your teen try doing a running commentary. This basically means that they describe everything they see without taking much of a breath. After a few things like, “I see a red parked car” and “there is a yield sign ahead”, they will complain that there isn’t anything else for them to see. Just tell them to keep going. This will cause them to look farther down the road for more objects. Brain muscle memory. Check. You will quickly notice where the gaps are in their driving – having to do multiple things at once can be tricky for a new driver. This will keep them humble. 5. Make them read the driver’s manual! Let me say that again, MAKE THEM READ THE DRIVER’S MANUAL…for real! Make them read the driver’s manual. Laws are constantly changing, this can be helpful for both parent and child. 6. Don’t teach for a road test. Your child has to drive for the rest of their life. Just passing the road test isn’t enough. Their thought process, decision making skills, and the physical coordination of driving all need to be comfortable for them, not something they are hesitating or overly thinking. Letting them go unprepared will just set them up for an accident that could potentially be tragic. 7. Have someone unfamiliar with your teen do a practice road test. A skills test done by somebody else is a fantastic benefit. This can give your teen the feeling of someone new looking at their driving and will give them the feeling that they will experience on the road test. Not only does it give someone else a chance to take a look at their driving, but if their teen doesn’t seem ready, it gives the parent “an out” for holding their teen off a little longer. 8. Reverse all the time! Have your teen back into the driveway every time they go out and drive. This will be very uncomfortable for your teen for a while. You both will know when they got it, because it will feel comfortable for them, and right for you. Your teen should do it like you would by turning around, getting up onto the seat to see the best you can. Grocery store parking lots are the real test. If on a semi-busy day they can go pick out a parking spot and back into it without causing chaos, that is a good indication they are ready for driving to their destinations after they are licensed. After all, what good is their license if they crash into cars all the time causing their insurance cost to skyrocket. 9. Practice with your teen driving on the highway. Start out on quiet mornings and gradually increase traffic by going at busier and busier times. Have them do lane changes over and over to get used to it. Driving should be a bit of a workout for them for a bit. Oh, and no radio. You do not want to compete with music while training them. Having someone in the car talking at them all the time is distraction enough. 10. What will they do to get around? Some kids really pay attention to where they are going, some don’t. Your teen will tell you they have GPS, so “No worries”. Except that watching them try to follow GPS and drive for the first time can be a scary thing! They won’t be used to doing it. Coordinating driving, listening to the directions, and being prepared to turn at an unfamiliar spot is a lot for a new driver. They should have a way to properly mount their GPS in the car. Learning how to find road signs and get around areas that they need to drive is key and should be part of the practice. Get them lost and have them “find their way back”. See how they pull over to use their GPS. What’s the plan if it doesn’t work? etc. Parent Taught Driver’s Ed – Are You Ready to Teach Your Teen Driver? I was petrified to get my own licence and I’m not looking forward to teaching my teen to drive. I’m really hoping my husband will take that on! These are great tips though. I was thrilled to not have to do the driving instruction! I did not start driving with our daughter until she was a little bit more capable. This is the first list of tips that has actually been helpful. My teen is extremely nervous about learning to drive in our bustling city and it is hard to find a quite street or vacant parking lot that a security guard will not kick us out of. Our state also requires me to log 30 hours of teaching time before he can take the drivers test. I will be using all of these tips. These are all great tips. As a professional tow truck driver, I’d like to add a couple more. My oldest son just got his driver’s license, and he’s actually a really good driver! I was a bit nervous when he first started driving, but he got the hang of it pretty quickly. I think it’s a great idea to have a running commentary to see what they are paying attention to, and we can tell our teen what they should be noticing. The running commentary is one I would not have thought of or insisted on, by as my husband was a driving instructor, it was a technique he used and felt was an important piece of the puzzle when teaching teens to drive. My son is 15 and just reading this stressed me out lol I am so not ready!! Haha! I am seriously more worried about my son driving (he turns 15 soon) than I was my daughter! His attention span and focus are WAY less than hers!